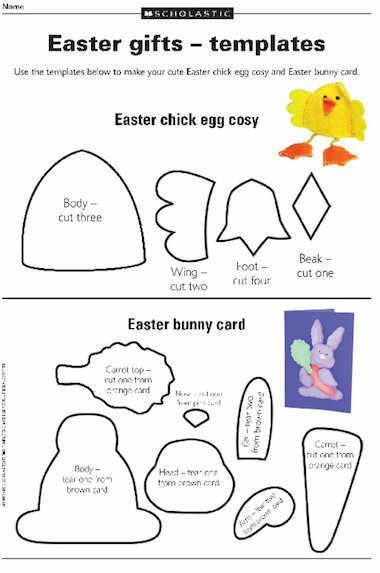 Use these templates to make a cute chick egg-cosy and Easter rabbit card. I’m sorry to say that I agree entirely with Angela’s comments. I am very disappointed with your new system. I also teach the 4-6 age range and feel cheated. The magazine is so thin when it arrives. Once you have removed the 2 posters, there is very little left to look at. I used to love when my new magazine arrived and waited for it with anticipation. Not any more. I don’t even feel tempted to open it when it does come. Thank goodness we can still look in the old issues, but this does take a lot of time. I would also like the old system back. Karen. Hi Angela @ Brussels – I’m sorry that you hadn’t found this resource on our website before your school broke up for Easter – very frustrating for you! It’s actually been in our bank of resources since March 2008 and has been downloaded 1000s of times since then. The Essential Classroom Resources section where The Little Red Hen and Through the keyhole: Giant’s castle are listed are top tens of downloads that you teachers choose and we have no way to influence over what is highlighted there. We’ve had so many new teachers on our Child Education PLUS pages that I think lots of people are discovering some of our resources for the first time. We’ve lots of resources planned for 4- to 6-year-olds in the coming months and across the year we’ll have an equal amount of resources for all age ranges from four through to 11. I hope that helps to allay some of your fears. My school received their Easter holidays on 26 March. There was no Easter Art resource available to me from your magazine prior to this date. Child Education Magazinewould have had this resource in their Feb or early March mag so that teachers could plan it in to their activities. Instead I had to spend additional time to find resources from other internet sites as the mag which I had subscribed to had not included it in their activities. What a shame.?? I also feel cheated with your new system as there does not seem to be sufficient amount of material for my age group 4-6 years. You seem to have piled your three mags on to one ….could we have the old system back please? Plus we are still talking about ’ the Little Red Hen and The Giant Peephole…....should we not be dealing with newer resorces rather than revisiting old ones? Come on Scholastic let’s raise the standard!